This Bowman PCL type card comes from the sort of set that tilts me to extravagance. It's been a white whale in the hunting, vanishing further into the distance each time I got close. Sometimes, one would appear at a show for $150. I'd skip it as "too pricy" and then see the same card appear on eBay for $300. I'd swear at myself, vow to "just buy it" when one appeared at a show, and then see nothing but slabbed copies for $500. This month, at last, a friendly dealer sold me this PCL #5 at a double-digit price, no haggling. It feels trite to say karma delivered at last, so let's stick with "patience is a virtue." My new #5 looks about the same as "normal" 1949 Bowmans (set profile), so why all the high prices? On the surface, it is like other 1949 Bowmans, with a blasé, block-color design that only looks good on guys like Satchel Paige. But that's not the real PCL story. The real PCL story is rarity. Bowman packaged and sold their MLB packs all over the USA. Probably hundreds of thousands of MLB cards remain in the hobby, but I suspect just a few hundred cards exist for each PCL player. My new #5 bears a great nickname, Xavier "Mr. X" Rescigno (career story). 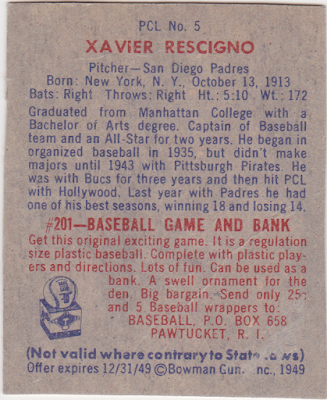 Kids in Pittsburgh might've remembered Mr. X as the day-in, day-out Pirates reliever during wartime, but his skills declined once peace returned and the rest of Xavier's career happened in the minors. Pacific Coast League players appeared on cards as far back as the 1900-1920 tobacco era, but almost always for sale in or near PCL cities. Bowman's PCL set was a unicorn: an East Coast attempt to sell West Coast ballplayers. Philadelphia-based Bowman published this one series of 36 cards, labeled them "PCL No. 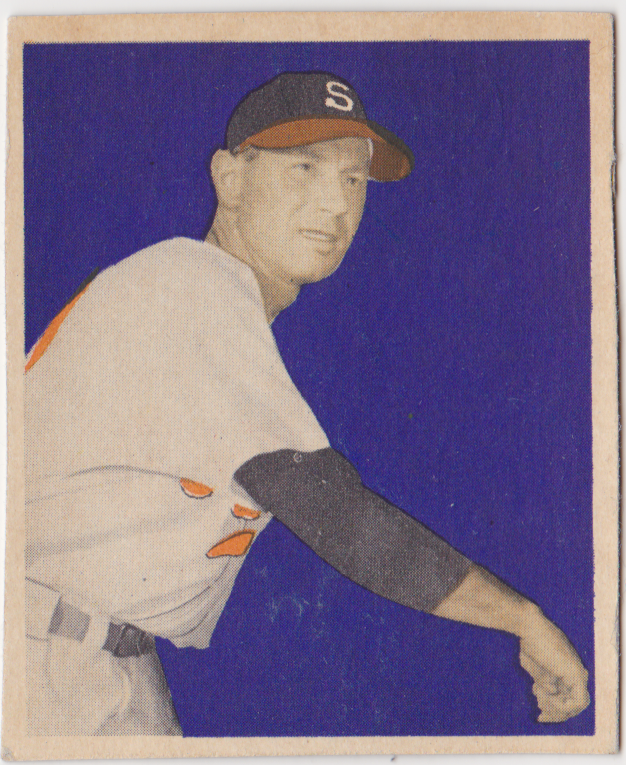 1 - 36," and salted them into late-season packs of the "normal" 1949 baseball set. Furthermore, it's believed Bowman test-marketed them in just two cities: Philly itself and Portland, OR. That's a tiny window of opportunity for collectors, so it's fortunate that test marketing wasn't the only way this set survived. Note the edges of my Rescigno are hand-cut, not factory cut, but it's otherwise the "right size." This means it was never in a factory-wrapped pack of cards. You can bet dollars to donuts that it came from a factory scrap sheet cut up by Meyer's junk shop on Filbert Street in Philly. Meyer's paid garbage collectors to scavenge for potentially valuable factory discards like uncut baseball card sheets. Shop hands later scissored the sheets by hand into single cards and sold them to collectors. Kudos to Dave Hornish for finding a 1978 article from The Trader Speaks that tells the story. 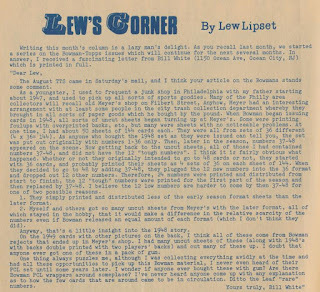 If you like similar tales from the dawn of postwar collecting, check the whole thread on Net54 for more. Also catch this thread with personal recollections on the factory-cut cards. So how rare are PCL cards? A low grade Bowman MLB single might be $2-3, but low-grade PCL singles run $50+. If any of Bowman's 36 PCL players were considered superstars, they'd cost $1000+. 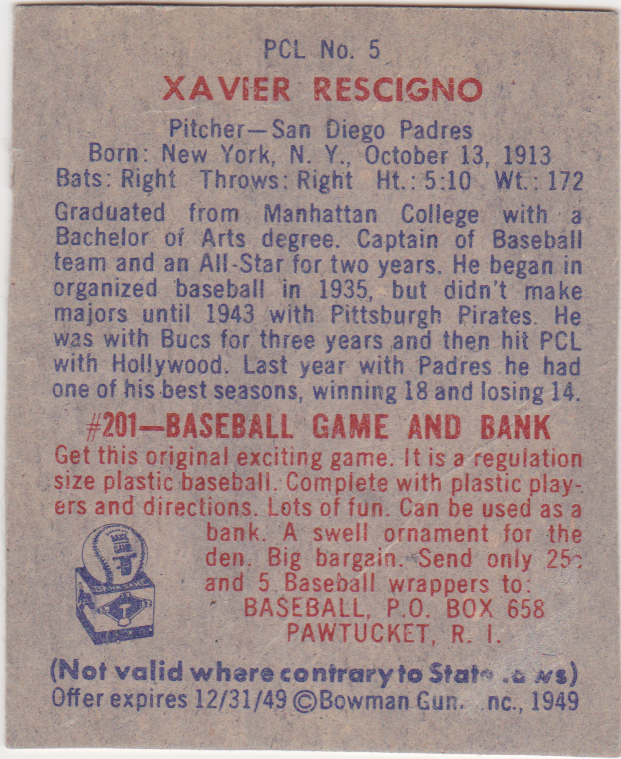 Hand-cut cards represent a hefty percentage of what's known in today's market, so finding cards from this set would be twice as hard without Meyer's efforts to make a buck back in the late 1940s. Here's another look at the PCL card back. 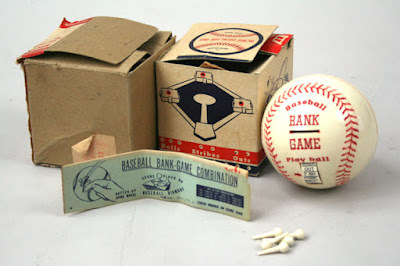 Today's collectors can also find the "baseball game and bank" under the name "Sealtest Dairy Products." The on-box game used white pins to track gameplay on the base paths shown on the panel below. I suspect Bowman bought a bunch of baseball tchotchkes on the cheap and added them as on-card promos to sell more packs and track how many customers they had in various cities. 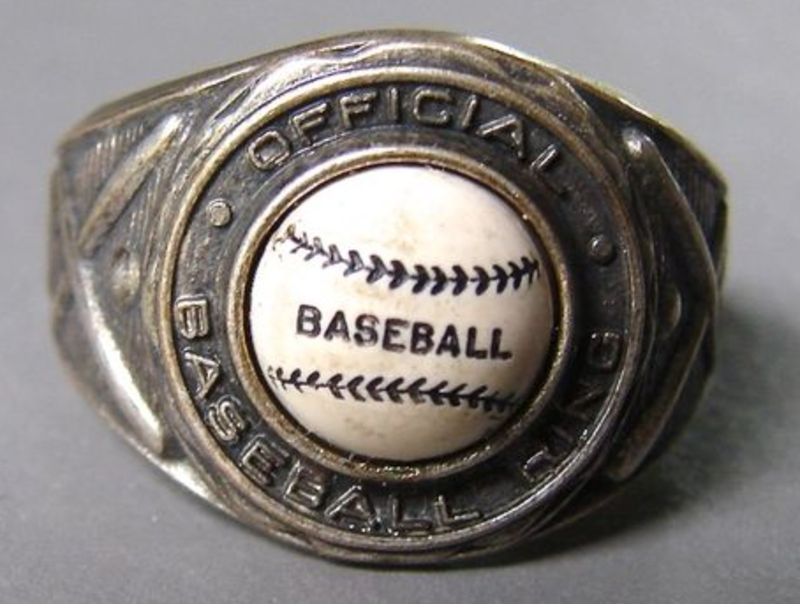 An earlier MLB series showed this ring ad instead. 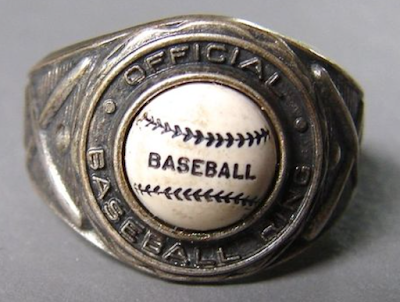 Here's that ring in the flesh. 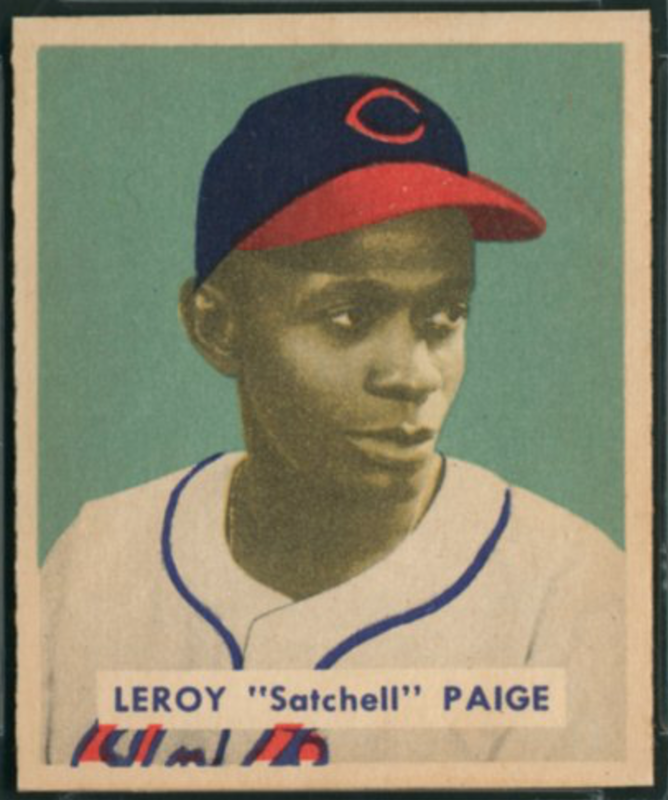 If you do go hunting 1949 PCL cards, bring a lot of patience and/or a lot of money. If possible, bring both! Value: This #5 cost me $90 and I'd happily pay that price again for a factory-cut version. Fakes / reprints: Complete reprints exist for the PCL set, both as single cards and uncut sheets. It's likely fakes also exist due to the set's rarity. Bowman MLB and PCL sets use the same card stock and basic design, so you can pick up cheaper MLB cards to familiarize yourself with what real PCL cards will be like, should you want to seek out type cards with some piece of mind. What a great post! It's always nice to see the PCL getting some love on the blogs. I have the faintest, almost ghost-like, memory of a card shop owner in Portland, who had a complete set of these. This would have been around 1990-ish, and since I was still relatively young, I had virtually no interest in anything that wasn't current to the time. My interest in all things PCL didn't develop for another 15 years or so, at which time (and even now), I wonder what ever became of that guy and his set. Thanks Jon, a complete set in Portland would indeed match up with the theory of where it was sold. So few sets exist, I hope it's still out there in one piece! Once you did get started on PCL, did you find a 1949 type card yourself? 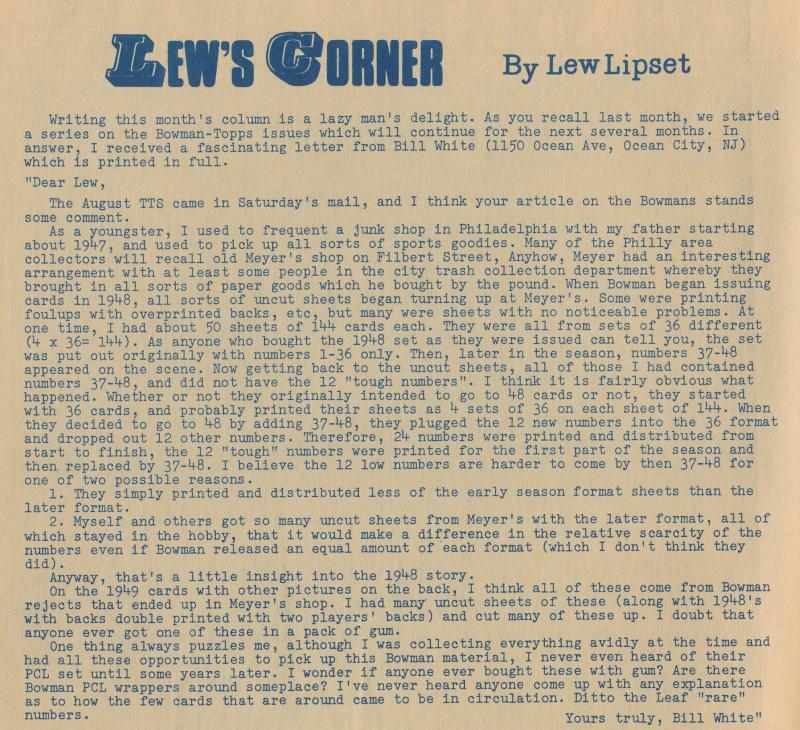 When I got interested in the PCL, I was still on a card collecting hiatus, so I basically just read everything I could related to it's history. And, no, I still haven't been fortunate enough to get a card from this set, yet! As you obviously know, trying to find affordable copies isn't exactly an easy task. So as of now, my only PCL cards come from the 1949 Signal Oil Oakland Oaks set, the 1949 Remar Baking Oakland Oaks set, and a couple from the 1952 Mother's Cookies. Oh yeah, those Mothers Cookies get kind of lost in the shuffle compared to 1952 Topps, but there are some nice cards in there! Best of luck if you're working your way toward the set.